At Chewy, we know how meaningful your four-legged best friend is to you, therefore we only carry the best in dog supplies, including dog food, dog treats and dog toys. If you've been searching for heart care dog prescription food, look no further. 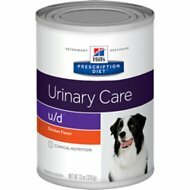 Among the wide selection we carry, one option to try is Hill's Prescription Diet u/d Urinary Care Original Dry Dog Food. Key benefit: promotes desirable urine pH levels and supports an overall healthy immune system. Another product is Hill's Prescription Diet h/d Heart Care with Chicken Canned Dog Food. Key benefit: clinical nutrition especially formulated to support your dog's heart health. Whatever it is you're looking for, Chewy has got you covered. Shop our wide selection of dog supplies today and treat your pupper to a box of new goodies. For all your pet needs including heart care dog prescription food, Chewy has you covered! We're here for you.